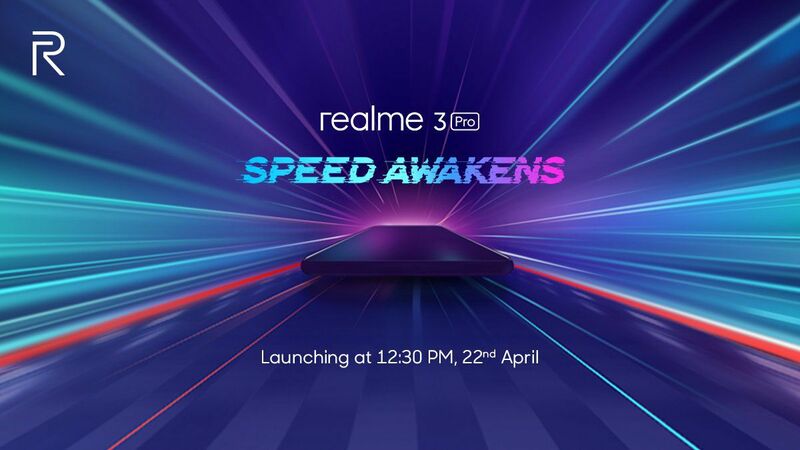 Realme 3 Pro Launch Date is Set for April 22 - Playfuldroid! The Realme 3 smartphone was unveiled in March and at its launch event the company had confirmed that it will be introducing the Realme 3 Pro smartphone in April in India. A launch poster that was reportedly shared and then deleted by the CEO of the company has revealed that the smartphone will be announced in India on April 22 at 12:30 PM. Realme 3 Pro is rumored to feature Snapdragon 710 chipset under its hood. Also, it could be the company’s first phone to come equipped with fast charging capabilities. It is speculated to arrive with VOOC 3.0 fast charging which is also available on the recently announced Oppo Reno series of smartphones. The smartphone could be arriving in three models such as 3 GB RAM + 32 GB storage, 4 GB RAM + 64 GB storage and 6 GB RAM + 128 GB storage. The predecessor Realme 2 Pro smartphone that was unveiled in September 2018 had also come in the same options. It could be coming with a waterdrop notched display of 6.3 inches. For photography, the smartphone may feature a selfie snapper of 25-megapixel and a Sony IMX519 16-megapixel + 2-megapixel dual camera module. It may come with a 4,000mAh battery.